Are you looking for the a great WordPress theme to start a new online venture? Check the best free WordPress magazine themes in 2018, featuring a guide to get started with WordPress investing virtually no money. There are a few things one should consider before getting a WordPress theme. First of all, you have to understand what WordPress is and why you should use it. If you already have a website, you can skip this part, and go directly to the themes selection, otherwise, let’s analyze a few facts. WordPress is the most popular content management system for websites, and that has plenty of advantages for new users. While using WordPress, you will have access to a virtually infinite library of free themes, resources and plugins. This allows you to take off virtually any type of online business. Regardless if you want to run a simple blog, sell digital goods or create a booking service website, WordPress can do it. That’s good, right? But that’s not everything, with WordPress you can do it without any investment, there are plenty of extremely powerful resources out there, partially or entirely free. If you already have a good hosting plan, you can skip this part. However, if you have no hosting plan or if you have something specially slow, this part is crucial. A fast and reliable hosting services is critical for the success of your online business, regardless if you pick a good free WordPress magazine theme. Getting this part organized is essential for your business, if you are still looking for a good hosting, check our guide on the fastest WordPress hosting companies. Before we finally get to the Best free WordPress magazine themes 2018, there is important consideration that should be always checked. If your website will also feature products for sale, you will probably need the WooCommerce plugin. However, many WordPress themes are not ready for WooCommerce, which means that, the theme will not behave well in product pages. For that reason, if you know you will be also running WooCommerce on your WordPress install, make sure that you test it right way. This will save you time and the need for changing themes down the road because of WooCommerce. As the title says, this free WordPress magazine is probably one of the best options if you plan to do a website featuring product reviews. Built with Bootstrap, this great magazine theme is Retina ready, and behaves greatly on both mobile and desktop browsers. This theme is ideal if you want to give a minimalist look to your site, but also if you want to monetize it with Google Adsense. 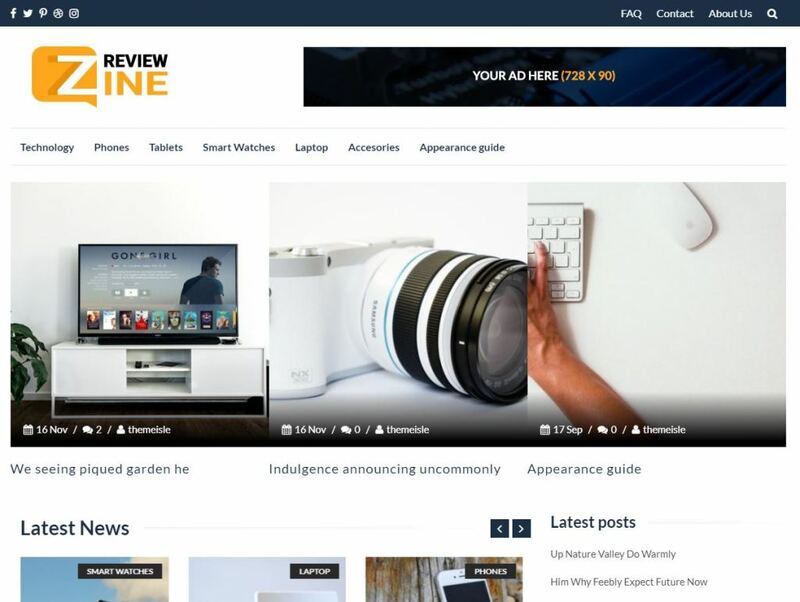 This theme is also highly customizable and works with most popular WordPress plugins, including WP Product Review. Since this theme focuses on minimalism, it is also pretty fast to load, which is a proven contributing factor for SEO (page speed). There are very few cons to this theme, however, if you want a very colour website, you might want to consider other options. Finally, ThemeIsle is the company behind the development of this WordPress theme. This is certainly one of the most popular free WordPress magazine themes, and it is also available for download at the WordPress.org website. One of the key features of FlyMag is its dynamic slider, which might be a good option depending on the type of project you are working on. Just like most themes available at WordPress.org, FlyMag also has an extremely fast loading time. It also uses lazy loading to improve user experience, delivering part of the content as the user scrolls down the site. FlyMag also has a PRO version, which might be useful depending on your needs. You can download the free version from both ThemeIsle and also inside WordPress. The PRO version is available on the ThemeIsle website. 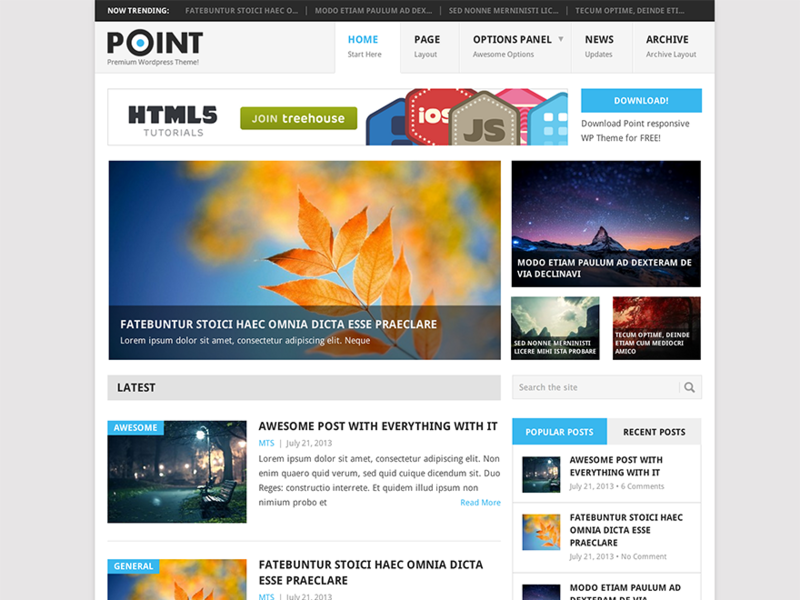 Point a great multipurpose WordPress theme with premium functionalities, and a great layout for magazine style websites. This theme uses the latest HTML5 and CSS3 to render fast loading, responsive websites with clean and powerful features. Despite being a free theme, Point is highly customizable, especially if you want a specific color layout for your website. It also features custom widgets, which allow the webmaster to create a beautiful flow for the end user. Point is also a SEO ready theme, which is a great advantage, especially if you will rely on visitors from organic search to broaden your audience. 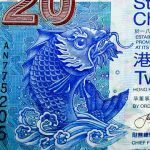 Like most free magazine themes in this list, Point is translation ready. This is a great advantage especially for those working with multi-language websites. MyThemeShop is the developer of this theme, and they also have other awesome free WordPress themes. Socially Viral is another of the great free themes available from MyThemeShop. 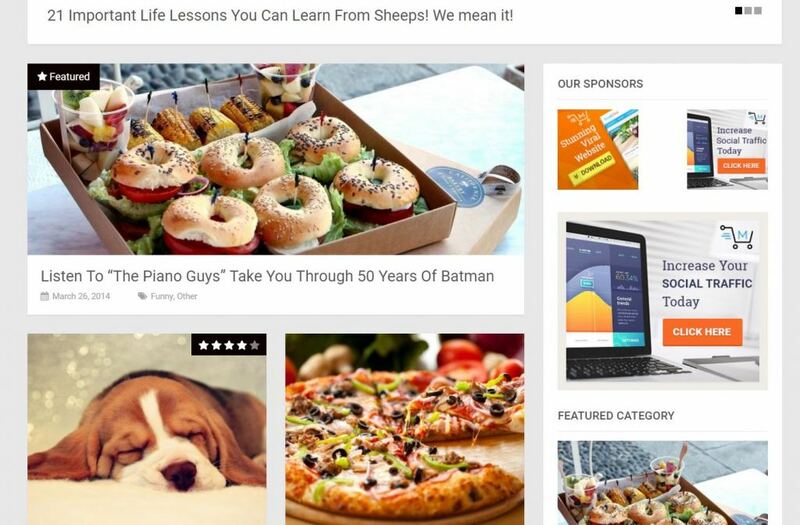 It can be used not only as a WordPress magazine theme, but also as a blog, or a website with quizzes for example. Socially Viral is without any doubt one of the best free WordPress magazine themes currently available. Socially Viral has a wide range of features that render it highly customizable. This fully responsible, SEO ready theme is ideal if your main focus is to target audience via social medias. The Socially Viral theme is also translation ready. Some of the other key features of the Socially Viral WordPress theme are: Advanced Control Panel, Lazy Load (improves page speed), WooCommerce Support, Sidebar available for both left and right, and many others. 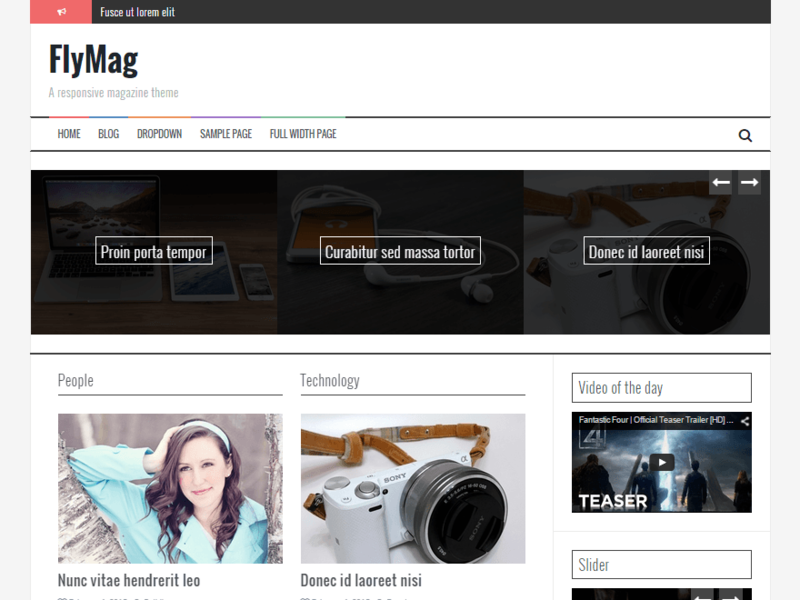 The IsleMag theme is in my opinion, one of the best free WordPress magazine themes ever built. 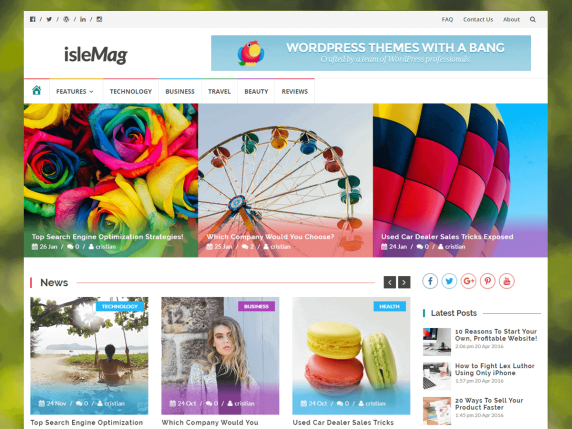 The IsleMag is a product of ThemeIsle, one of the most renowned WordPress themes developers currently. Among its many vantages, IsleMag has a very clean code, making it very easy for users to edit or create child themes based on it. That is true even if you don’t have strong coding skills, just basic HTML/CSS and Php will do the trick. In terms of functionalities, IsleMag also excels. Its responsive design is compatible to all major web browsers, and you certainly will not have any compactability issues. Just like most WordPress magazine themes on this list, the IsleMag Theme is also translation ready. 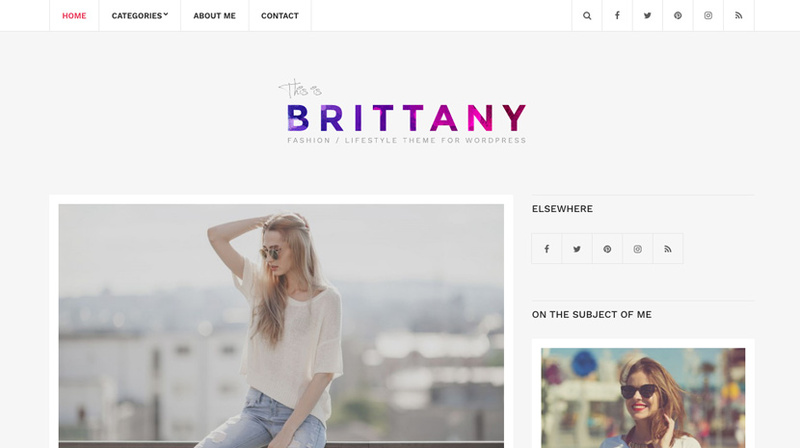 Britanny light is an excellent free WordPress magazine theme, especially if you are working in the fashion, or home-decor niche. Its design is extremely clean, and its also very light to load. This free WordPress magazine theme was developed by cssigniter, one of the most renowned theme developers for the world’s most popular CMS. Its responsive design behaves extremely well in most browsers, both on PC but also on mobile devices. Some of its main features are its custom widgets and social media options, ideal if you want to promote your articles on Facebook or Pinterest. Other than that, it is a SEO ready responsive theme, making it easier for you to get a good rank on SERPs. 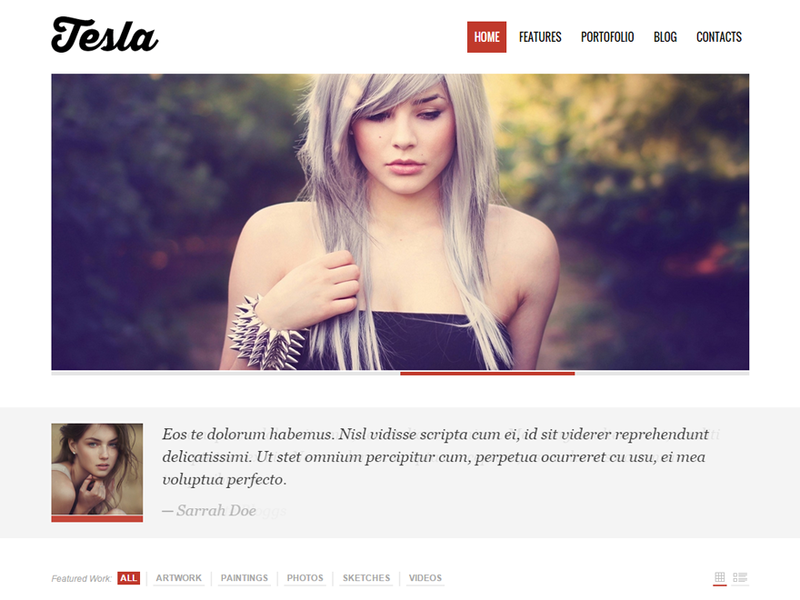 Tesla is one of my favorites multipurpose WordPress themes, and it is easy to understand why. Apart from being free, like all other themes on this list, it has a beautiful design and behaves very well for magazine themed websites. You will be right away blown by its design features, including a slider that uses the jQuery library, HTML5 and CSS3. Apart from that, it has many other features, including a lot of built-in short codes, to make your life easier. It also features an AJAX contact form, and as you probably know, most WordPress websites need one. It’s really beautiful design is suitable for magazine style blogs, especially those focusing on art, fashion, photography. Considering Tesla is a free theme and it delivers so much features, it definitely deserves a place among the best free WordPress magazine themes. Even if the WordPress theme is one of the key aspects of any website using this platform, there are other important features that you should consider. These other features make a lot of difference when it comes to bounce rate, user retention and the most important thing for any website: conversions. Regardless of the theme you want to choose, you want to optimize its speed as fast as possible. That includes relatively small image sizes, and having a fast (ideally cloud server). You can use services like Google Page Speed Insights and GTMetrix to access the speed of your site and what can you do to improve it. Even if you have a fast loading template and optimize most aspects of your site, there is still one crucial thing that must be done. That is, choosing a fast hosting. Slow servers are usually caused by two factors: servers far away from your target audience, or too slow overused servers. The second scenario happens much more often than the first, and for that reason, choosing a powerful hosting is essential. If you have a global audience, check our post on the fastest WordPress hosting companies for more details. On top of that, it is highly recommendable to use a VPN to optimize your site speed.